Bad exhibitions cannot happen at the Yorkshire Sculpture Park. The set-up won’t allow it. It’s such a vigorous location, in such a romantic part of the country, that the act of going there is enough to get the serotonin flowing. What skies. What vistas. What horizons. You could put on a Jack Vettriano show at the YSP and it would still be rewarding. On second thoughts, no. That’s going too far. But you catch my drift. It’s the combination of art and nature that works here. In these surroundings, an artwork is never alone. The trees help it out. The smells help it out. Even the sheep help it out. Watching a flock of fluffy ewes rubbing their backs against a Henry Moore bronze that’s been cast adrift in a Yorkshire field is immensely pleasing and seems somehow to add a note of realism to the Moore reputation. Lucky sheep. I like to rub my back against a Henry Moore sculpture as well, and at the Yorkshire Sculpture Park, I can. So the location does most of the work. It turns the act of looking into an adventure. It’s fun to follow the trails and track down the works. And with the weather constantly changing, particularly at this time of year, the art keeps swapping costumes. A sunny sculpture has a different presence than a sculpture in the rain. What’s icy in the morning is golden in the evening. Most of the time, this flexibility is a plus. Occasionally, however, it becomes a minus. Bad exhibitions do not happen at the YSP, but you do get shows that seem never to find a final focus. When the weather is blurry and the art is blurry, so too is the achievement. That’s what happens with Tony Cragg. Instead of aiding him, the shifting rural circumstance becomes a handicap. I am a big Cragg fan. He came to prominence in the 1980s as one of the so-called New British Sculptors, a gang of aesthetic bandidos who led art out of the Henry Moore era. I won’t bore you with the details, it was all so long ago. 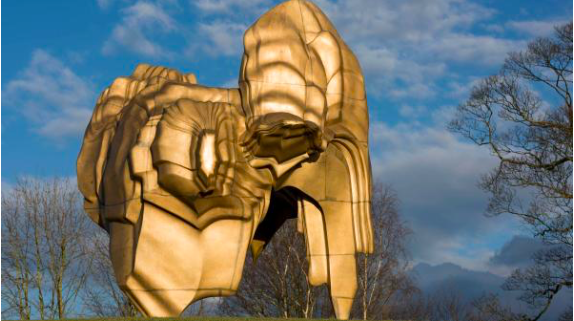 But back in the 1980s British sculpture was dominated by the lumpy bronze presence of Moore. Wherever you turned, there he was, blocking the exits to modernity like the Berlin Wall. The NBSs — who included Richard Deacon, Bill Woodrow, Anish Kapoor and Alison Wilding, as well as Cragg — introduced new materials, new textures and colours, new similes, new frames of reference. They jumped the wall and scarpered. For a glimpse of how effective they were, pop into Tate Britain, where the big Duveen Gallery at the centre is currently given over to their produce. It is years since the Duveen Gallery looked this good. Cragg’s contribution was marvellous. His first incarnation involved the production of inventive wall reliefs made from bits of multicoloured plastic he found washed up on the beach. Where most British beachcombers at the time came back from their dog walks with shells, pebbles and feathers, Cragg was returning with discarded bottle caps and containers for washing- up liquids. His masterpiece in the genre, Britain Seen from the North, which belongs to the Tate and isn’t here, featured a map of Britain turned on its side observed from its Scottish end by a Cragg self-portrait. If you came across it in a street you might mistake it for a Banksy. The wall pieces were punchy and fresh. This was art with an ecological point to it, as well as a brash sense of modernity. 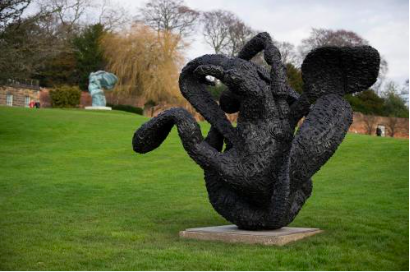 The YSP tribute contains only one example, a stretched-out elastic man, tied in a knot, dating from 1985 and cheekily entitled New Figuration. More would have been welcome. Unfortunately, these poppy Bayeux Tapestries turned out to be largely unrepresentative of Cragg’s sculptural urges, as the work that is unveiled for us here makes pretty clear. Billed as an overview of his career, the Yorkshire look-back skips through his early days at breakneck speed, then loiters for an age among things produced in the past decade. The result is a tribute to an artist who’s doing a Henry Moore on us: who’s found a mature style that pleases him, who fiddles with sizes, textures and colours, but who keeps arriving at the same destination. Let’s not beat about the bush: it’s very repetitive. The first one you see is called Caldera, a gleaming blob of yellow bronze that sits atop the opening hillside as you drive into the YSP. Imagine a giant molar whose insides have decayed. You can walk around it and inside it. And the shapes it is made from have a droopy recurring geometry to them, as if they were formed over thousands of years by the drip drip drip of liquids. It’s an impression shared by most of the works on show. What we are encountering is not so much a finished shape as a set of processes that have led to a finished shape. Outspan, from 2008, which is bright yellow and sits surrounded by yew hedges on the formal terraces of the YSP, looks like something you’d get if you squeezed mega-yellow toothpaste out of a mega-yellow tube. 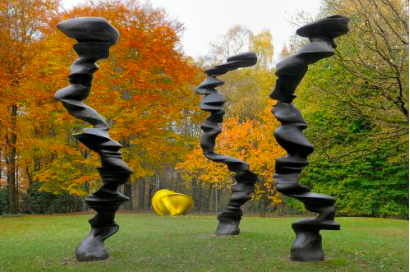 Points of View, from 2013, which balances on the main gallery lawn, depicts the swirling energy that a trio of dust devils might bring with them if they made it over to Yorkshire from Texas. It’s made of bronze, but what it captures is a sense of chaotically spinning upward motion. Lots of the exhibited sculptures — too many — convey similar sensations. The sense of swirling has become a sculptural habit. Cragg’s USP is that he comes from a scientific background. Before going to art school he worked as a lab technician at the National Rubber Producers’ Research Association. So there’s lots of nerd in him. He’s an artist in a white coat. And that’s something you intuit quickly in the neatness of the works scattered about the grounds of the YSP and clustered in two sets of its galleries. 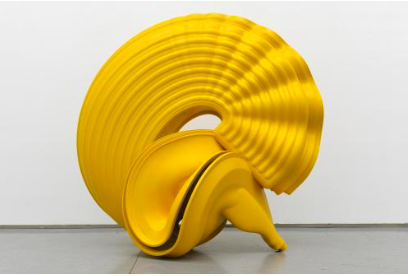 Precision, exactitude, technical efficiency are the Tony Cragg givens. It’s also true that the similarities can be deceptive. When you get up close to a Cragg sculpture, there are invariably discoveries to be made in the underlying structure or the complex interplay of materials. Everything is beautifully worked and precisely calibrated. If convoluted internal exactitude were a key sculptural quality, then everything here would be a key sculpture. But it isn’t. Sculptures need also to have an effective outline. With its big skies and stretching horizons, the YSP is an unforgiving backcloth for art that appears more interested in processes than in shapes. After a dozen examples, the patterns strike you as blueprints rather than explorations. Encircled by natural solutions that seem so much more varied than his — trees, hills, rocks, skies — Cragg the inventive lab rat is shown up by the surroundings. I hate to say this, but I think this show would look better in a city. « O Mother, Where Art Thou?